Even without the benefit of armaments, Pinner Hill remained comparatively unspoilt. Miss C A Lejeune records in her autobiography how, in 1925, she and her husband in their search for a place “within reach of London, but away from the rush and tumult; a place where one could breathe fresh air,”1 discovered the new private estate of Pinner Hill and bought one of the first plots of land at the foot of the Hill. The picture Miss Lejeune paints of the surrounding area is almost irreconcilable with how it is today: “When we first moved here from London we felt we were living in the heart of the country. Our house was at the end of a quiet lane, hedged with hawthorn, honeysuckle and wild roses. On each side of the lane were fields, a few of them under the plough, but most of them pasture land, with cattle grazing. It was wonderfully peaceful, with larks and nightingales in summer...when you got out of the train from Baker Street the air was like wine.”2 Miss Lejeune describes how the new community got to grips with making gardens out of the rough, open meadow land around them, planting trees, swapping gardening tips and taking advice from George Herring, a man who “handled flowers as tenderly as if they were children” in his capacity of groundskeeper of the Big House on Pinner Hill. It was the Griggs brothers who were originally responsible for developing the Hill, acquiring Pinner Hill House and the surrounding land in 1919. The country house they purchased was somewhat of a mishmash of architectural styles; the culmination of a number of previous owners’ differing tastes and eras. The house as it stands today was built in the 1780s and added to in the first part of the nineteenth century and again in the 1860s, but a mansion has existed on this plot since at least the 1630s, when Sir Christopher Clitherow decided that he would like a country pile befitting his social rank of Lord Mayor of London and acquired a part of the 135 acre Pinner Wood, known as Spinnells. Perhaps the most famous of those occupiers seeking a hideaway was Sir Bartholomew Shower, a prominent judge at the time of King James II whose terrible reputation in London came back to bite him on the nose when the king fell from power – he too was stripped of his influence and sought a place of refuge to escape the limelight in the late seventeenth century. The house passed through a number of families, with many making renovations. However, one of the late 17th Century owners clearly had a penchant for bowling, as a bowling alley was commissioned beside the house in 1691. ‘Pleasure grounds’ were extended around the house by the new owner of 1820, Dr. Albert Pell, from which his son watched the Houses of Parliament go up in flames in 1834.4 Rennovations to the house at this time included several changes to the windows, the southern side being graced with a French window, a sash window at first floor level and a lunette, or half-shaped moon window above that. The house was then bought by the Tooke family in 1844, a prominent family who featured regularly in local life and are even commemorated by the fountain on Tooke’s Green in Pinner for the part played by W A Tooke in the restoration of the church. This was the period in which the house adopted the fashionable Gothic style of the day with the old colonnaded Georgian front and bay windows altered and hidden by the Victorian wing erected by A W Tooke in 1864. Romantic ideas, the vogue for nature and the outdoors demanded improved views of the grounds, which in turn allowed greater benefit from sunshine and placed a greater emphasis on the garden. 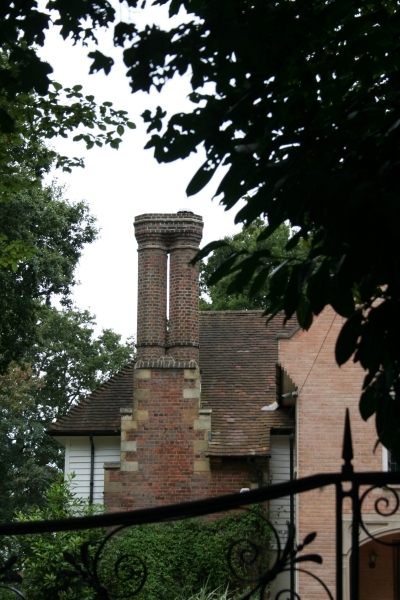 The Tookes had also acquired Woodhall Farm and it seems that they were determined to make an architectural impact with the construction of three distinctive towers, one known locally as ‘Tooke’s Folly’ at Woodhall, one at Pinner Hill House and one at Pinner Hill Farm (dated 1864) – the barn and clock tower of the latter can still be seen today, but the other two have been demolished. In addition to the Victorian Wing and the three distinctive towers, Arthur William Tooke proceeded to furnish inside the house, installing dark oak panelling in the dining room and a typical Victorian liver-coloured fireplace, flanked by panelling in which the initials of AWT can still be seen today. Above the fireplace are plaster motifs showing a Tudor rose on the left, presumably symbolising his English nationality, and a fleur de lys on the right, for his French-born wife Nymphe.5 The natural theme continues with friezes of leaves, acorns and flowers in the hall, typical of that period in the early 19th Century. William Tooke inherited the house on his father’s death in 1871 and fulfilled the duties of the quintessential country squire. After his death in 1884, the estate was inherited by his only sister Alice Hesham Jones, who sold it in 1903 to Samuel Dore, whose death in 1919 brought about the development that was to create the Pinner Hill Estate as we know it today. Miss Lejeune, one of the first people to move here with her family in the early 1920s and whose son still lives in their house, ‘Lane End’. at the foot of Hillside Road, came to Pinner in search of somewhere “green and calming”.6 Pinner Hill House had been bought by Griggs & Son; builders originally from Dartford in Kent, based in Victoria Street in London. They had been responsible for building the Odeon cinema in Leicester Square, but were interested in developing more rural areas. The Griggs were apparently keen golfers, for they decided to develop Pinner Hill House and the surrounding land into a golf course, and sell off plots for housing development further down the hill. 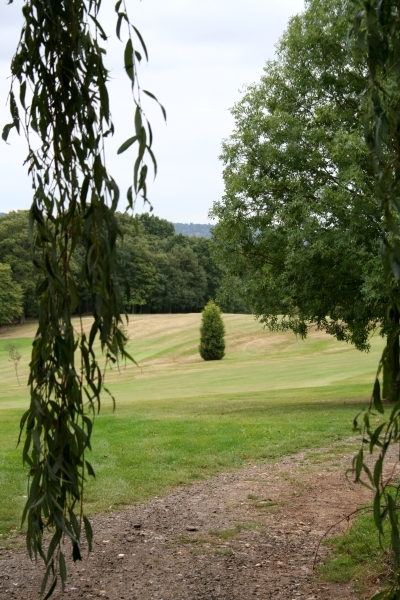 The well wooded slopes, lined with oak, ash, elm, copper beech, scotch firs and silver birch were deemed the perfect location for a golf course, and Mr. J. H. Taylor went ahead with the planning out of the course, being a respected and well-known golf professional of the time, and there have been only minor alterations since. With two nine-hole loops around the three main ridges, it is a challenging course with very few flat lies. There are a number of notable trees on the course; the second oldest oak tree in Middlesex graces the eighteenth hole, with an estimated age of two hundred and sixty years (based on girth measurements taken over 24 years and a ring count of a major branch)7 and to the right of the same green lies a mulberry tree, the solid survivor of a pair of trees whose leaves were used to feed the silkworms at the British Empire Exhibition at Wembley in 1924. Plots of meadow land were sold in half or single acre plots, and there was a recreation ground where the cul-de-sac is now off Potter Street Hill. Potential buyers would visit Griggs’ office, take their pick of the selection of architectural designs on offer, purchase the plot and then Griggs would build the house. Apart from the flurry of famous visitors hosted by the Lejeunes, there are a number of other notable houses on the hill with interesting stories to tell; two such houses are those designed by Mr. Blunden Shadbolt, a prominent architect of his day who specialised in building olde-worlde houses in the ‘Tudor Revival’ or ‘Arts and Crafts Movement’ style. Shadbolt was in a sense a man well ahead of his time – his houses were made from recycled materials, usually from old Tudor houses or barns, and he liked the sense of authenticity which this inherent ecological attitude imposed on his houses. 1926 was a busy year for Shadbolt – it was in this year that he built ‘Pond Cottage’ in Pinner Hill for the wealthy songwriter D’Auvergne Barnard in 1926, and ‘Monks Rest’ in Hillside Road. The story behind ‘Monks Rest’ is an appealing one; the building is constructed from medieval timbers and a gabled tiled roof, materials salvaged from an old Friar House at Horley which date from around 1400. The house itself was originally exhibited at the Ideal Home Exhibition in 1924, where over 100,000 people passed through its oak doors including King George V10. The building was then dismantled and painstakingly reconstructed in its current location at the foot of Hillside Road. Other houses built in the ‘Tudor Revival’ style include ‘Naseby’ in Park View Road, designed by J. E. Salisbury and ‘Oakwood’, designed by L. J. Williams. But the house on the hill with perhaps the most controversial history is ‘Sans Souci.’ Built for Von Ribbentrop, the German ambassador to the Court of St. James at the outbreak of the Second World War, the house served as a retreat from the German Embassy in Carlton Terrace and the relentless hounding of the British Press. Mr. Tony Woodley, of ‘Pond Cottage’, recalls how the Griggs brothers had met Ribbentrop at an event in London and learned that he was looking for a country residence to escape the city on the weekends; Pinner Hill was suggested and it was agreed that Ribbentrop take one of the remaining plots on the Estate, provided that he could use his own architect from Berlin and German building materials. The Griggs brothers reported that Ribbentrop had visited the Golf Club House once or twice in a neighbourly spirit for drinks, despite the less-than-friendly swastikas that his staircase is rumoured to have featured. The Foreign Ministry appears to have registered ownership of the house under the name of H. E. Grosswendt; it was also the Ministry who named the house ‘Sans Souci,’ after the palace built in 1744 by Frederick the Great at Potsdam in southwest Berlin. The house has been shrouded in rumour ever since, with theories about it being a Nazi observation centre due to its proximity to Northolt, a “partying annexe” for German officers and even the inspiration for Agatha Christie to have “Hercule Poirot involved in a car chase tracking a femme fatale German spy to its well-guarded gates.”11 This last claim seems rather far-fetched; the only German ‘femme fatale’ known to have lived in the house was Herman Goering’s sister, who had been interned on the Isle of Man during the war as an enemy alien and occupied the house after Ribbentrop’s return to Germany to take up his post as Foreign Minister. The Second World War affected Pinner Hill not only in the residents that it attracted, however; Pinner was far enough outside of London to miss the full horror of the bombing, but sixteen miles from its centre was enough to give its’ residents trouble sleeping. Nissan huts were erected between the green and the house on the ninth hole of the golf course for the WAAF, Women’s Airforce personnel, to sleep in – rumour has it that one of the women hanged herself there. During the war the RAF used the Golf Club House chiefly for victualling and recreational purposes, but land was also commandeered across the third, fifth and sixth holes when a field of corn and other crops was planted to combat food shortages. The positioning of Pinner Hill within earshot of a least a dozen different siren systems, covering Herts, Bucks, Middlesex, and even, when the wind was in the right direction, Surrey and Essex, meant that a good night’s sleep was impossible. Residents lived with the constant presence of war just as much as any inner-city Londoner, and struggled with the constant horror that comes with living beneath the bomber lanes into and out of London – one night a bomb fell near the golf club, and the crater is now a grass bunker next to the eighth green. On another night, Miss Lejeune describes how a basket of incendiaries dropped into their garden, “and within minutes the rose-beds seemed to be crawling with ARP Persons, advancing on hands and knees with strange extinguishers, retrieving bits and pieces of foreign matter for daylight examination.”12 The image she creates in her autobiography is one of community spirit in the face of fear – neighbours shared their air-raid shelters, meals were eaten together, mothers consoled each other’s children as the thunder of aircraft plagued their dreams. The general feeling once the war had finally ended was one of exhaustion. The orange of the sky, illuminated with burning oil-vats, the rumble of the guns at Dunkirk, the insistent siren systems and the perpetual strain and terror in which people lived during the war years had taken its toll. 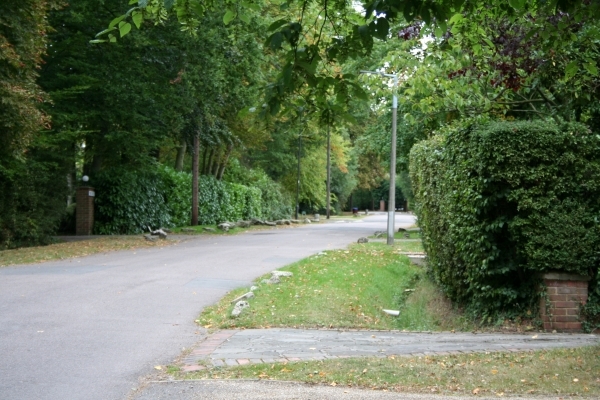 None of the houses on Pinner Hill was damaged by the Blitz, but the local area suffered some severe injury. Everywhere bore the signs of destruction; records tell of the mile-long wreckage on the High Street at Wealdstone, the pub and shop destroyed on Batchworth Heath, the bombs which fell behind Merchants Taylors’ School. With only three bombs on the golf course, Pinner Hill was lucky to escape the full extent of the horror of the Blitz, but living here was still something of an ordeal. Today the skyline of London is a comforting conglomeration of orange twinkles – Wembley Stadium can be easily picked out, as can the semi-circle of the Millennium Wheel at Westminster. The bowl of Middlesex is more densely illuminated than ever before, but Pinner Hill remains something of an oasis of calm on the fringe of a more fraught urban environment below.